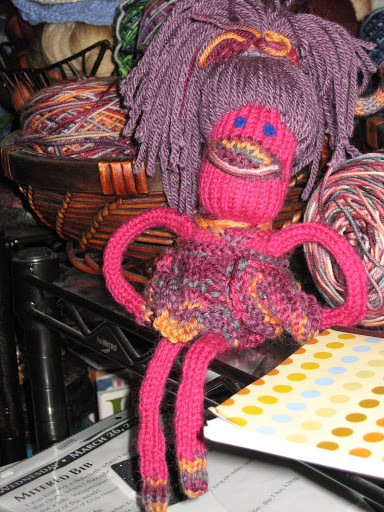 I there knitting friends! It is officially summer, the middle of June. I am finally blogging again. 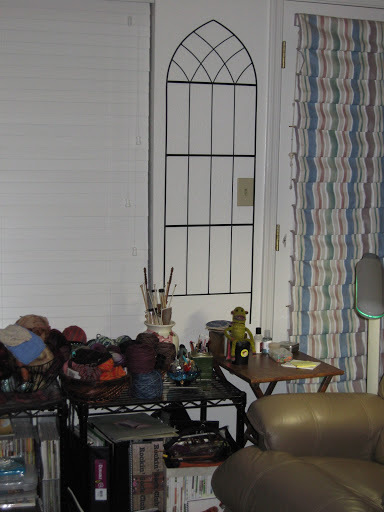 I had rotator cuff surgery on June 9, and since my injury wasn’t to the point where a lot of repair work had to be done, I have the official blessing of the orthopod to type on the computer and knit as much as my pain level permitted. Which isn’t as much as I had hoped it would be, oddly enough. 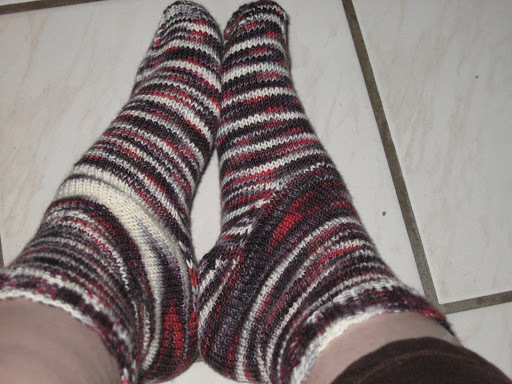 I did finish these, with the aid of Vicodin and donut holes. 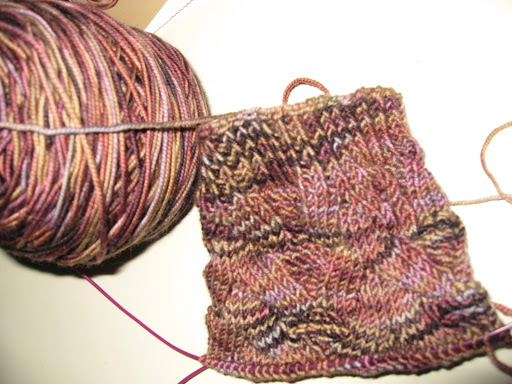 And I worked on both of these–the coriolis (the one on my foot) I started at Sock Camp and the Monkey KawKaw I started while under the influence of drugs, because if I was thinking clearly I surely would not have cast on yet another pair of socks. 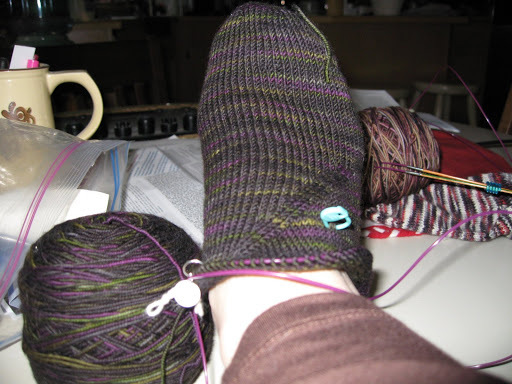 Or technically, a sock, since for some reason I am doing only one, another clue that my thinking is clouded. which I purchased and turned into this. I can look at these wonderful Blue Moon colors while new ideas percolate in my mind. and this little wild dancing monkey for Lilly, whose mom is a wonderful Public Health Nurse that I appreciate greatly! 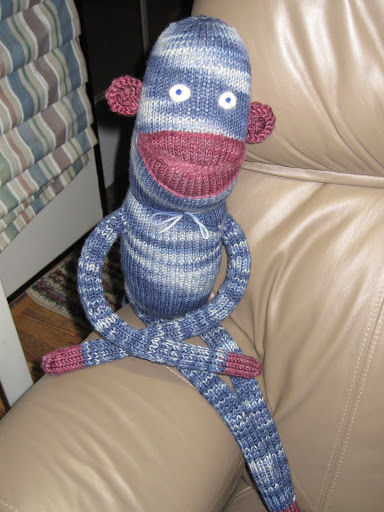 This monkey’s name is Nelly, a combination that Lilly came up with to combine her name and mine. Last I heard, Nelly was much loved and was going to show and tell. I will spare you the photos of my shoulder. I am getting more range of motion every day and I see the surgeon next Thursday. I have no photos of WWKIP Day, even though it was yesterday. 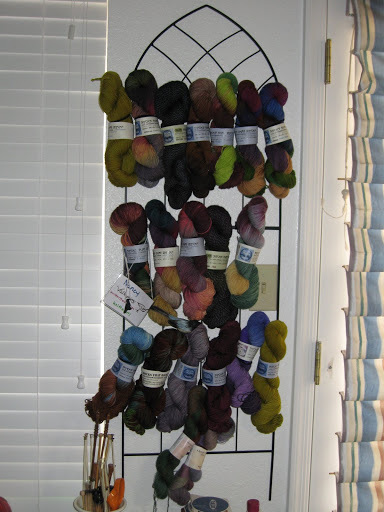 I am envious of everyone who had gatherings in climates conducive to gatherings of knitters. The desert southwest doesn’t lend itself to gatherings of this sort when it is 113+ outside. 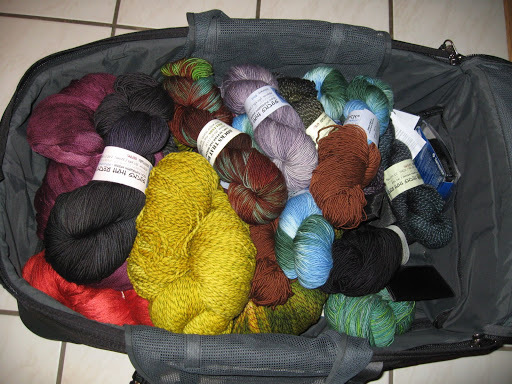 Till next time, happy knitting! Yay summer!! But I still miss camp!! Don’t you??! I love how you have your yarn set up…looks great 🙂 And the monkeys look fabulous! Cockeyed would be proud!